The sun came out this week (albeit briefly, before disappearing behind dark grey clouds and returning us to an autumnal chill) and showed us a glimpse of what summer could be like this year. So, for the couple of days that I actually did feel the sun on my face (didn’t I? ), it brought me to thinking of the family’s favourite summer pudding – Eton Mess – a heady mix of sharp summer berries, velvety whipped cream and crisp, sweet feather-lite meringues. 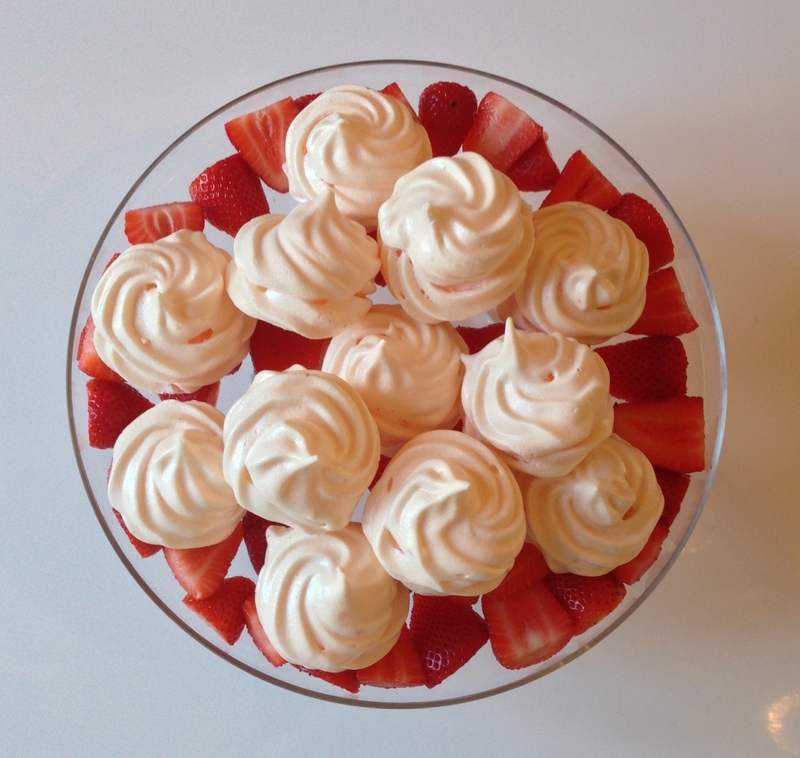 Now I will admit that I normally cheat with this dessert, using shop-bought meringues instead of home-made, as I have been hugely unsuccessful in the meringue baking stakes in years past. My last attempt (in 2010, whilst holidaying in Cornwall using a recipe I had Googled off the internet) resulted in a weeping mess on the baking parchment and I’ve steered clear ever since. Maybe this weekend is the time to tackle my baking nemesis head on? It’s Saturday afternoon. My husband is out doing a 26km run and my eldest daughter is off at a birthday party. I therefore, have a couple of hours to craft a sugar and egg-white based delight/disaster. Only my 3 year old is present to witness if it becomes a complete car crash – in which case I’m sure some form of chocolate based bribery will be able to convince her “it never happened”. Admittedly things didn’t start off too well, with me breaking the cardinal rule of meringue making – splitting one of the egg yolks whilst separating out the whites… the next 10 mins were spent removing the strands of yolk from the sea of egg whites using a variety of tools and tricks – probably wasted 2 egg whites in the process, but with them replaced and all traces of yolk removed it was onwards an upwards. After last weeks success with Jammy Dodgers I decided to stick with the GBBO Showstoppers book this week for the meringue recipe. I was impressed that despite my nerves the meringue came together pretty quickly – much to the joy of Boo who was sat patiently in front of the mixer, just waiting for the moment I gave her permission to lick the spoon, spatula, bowl, and anything else she could get her mitts on. I’ve never used cream of tartar before but it definitely seemed to add a little something to the egg whites when it was whisked in. The hardest part was trying to fully incorporate by hand the food colouring (rose pink and violet) without: a) Losing too much air out of the whisked whites; and b) Doing it quick enough to prevent the sugar from completely dissolving and therefore making the meringues weep in the oven. I think I just about got away with it. I had drawn round the base of one of the girls beakers (5cm diameter) on the baking parchment as a guide for piping out the meringue mix (large star nozzle). I soon realised though that I was going to have an awful lot of meringue mix leftover if I just did a single round of piping (using 2 baking sheets; 12 per sheet). I never like waste, so I ended up double layering the piping. 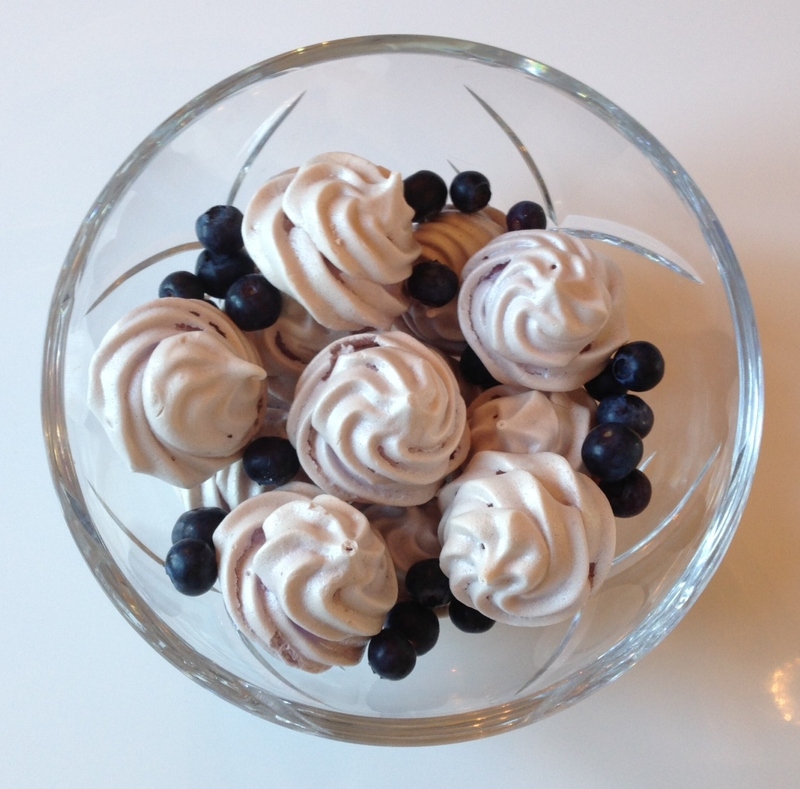 It meant that I did use up most of the meringue, but they were no longer going to be the little dainty numbers I had envisaged. I baked the meringues in the oven for around 1hr 20 mins. They were cooked through, but ever so slightly starting to dis-colour (the rose pink was turning more of a salmon pink), so will probably try for about 10 mins less next time. Also the violet meringues had some air holes appearing, as if the inner meringue was about to collapse away from the outer skin (hence why I think I just got away with it with regards to over mixing the sugar and food colouring). Otherwise, pleased as punch with the resulting bake. Even considering whether to take it up a notch next time with a Pavlova? Regardless, now just need to whip up some double cream and mix in some strawberries and blueberries and we have the makings of a damn fine Eton Mess.